01.07.13 On October 6, 2012 Matthew Fishbein won the open section of New Hampshire Amateur, played in Manchester, with a perfect score of 4.0 points in four rounds. Winning this tournament came with another milestone for Matthew: his highest USCF rating a whopping 2125. (Matthew has since increased that rating to high of 2131.) Congratulations Matthew and we look forward to following your chess exploits in 2013! 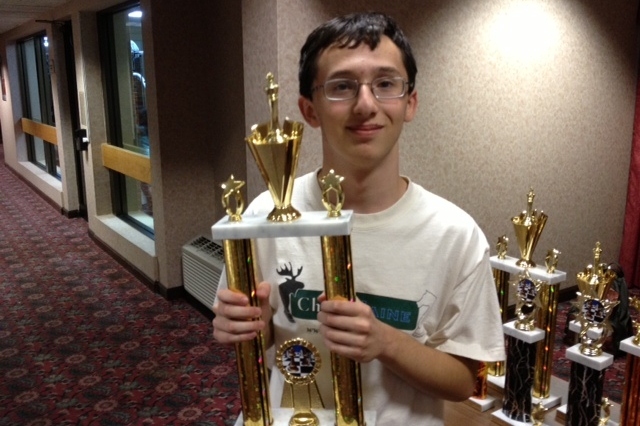 Matthew showing off his NH Amateur trophy while proudly wearing his ChessMaine.Net t-shirt! When you play well the T - shirt makes you look more professional and smarter.